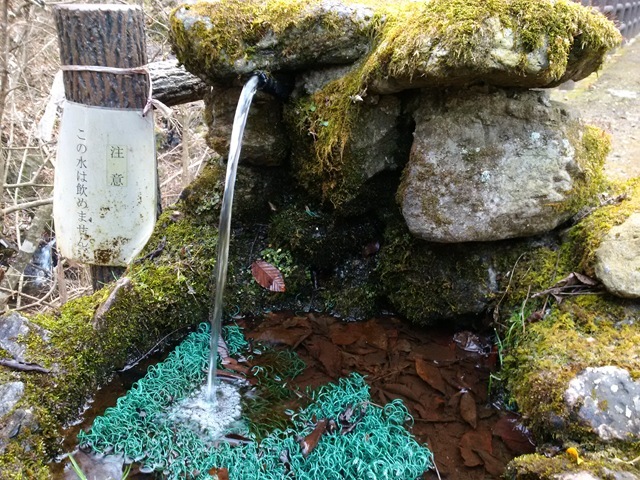 My aim of hiking the three famous peaks of Okutama – Odake, Mitoh and Gozenyama hadn’t quite come to fruition by the time Oshogatsu time came around. But after recharging my batteries over Xmas and the New Year – and armed with my new toy, a Garmin e-Trex20, compliments of Santa – by the first weekend of January I was ready to tackle the last of my trio of treks. 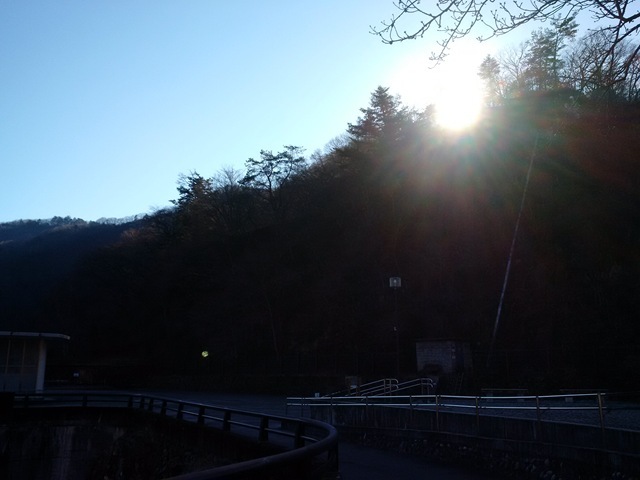 The trail to Gozenyama (御前山) starts pretty much at the southern end of the great Okutama dam. At 149m high and 353m wide, the dam is an impressive feat of engineering. Finally completed in 1957, it holds back over 185 million cubic meters of water at full capacity, supplying large swathes of the capital with both fresh water and electricity. 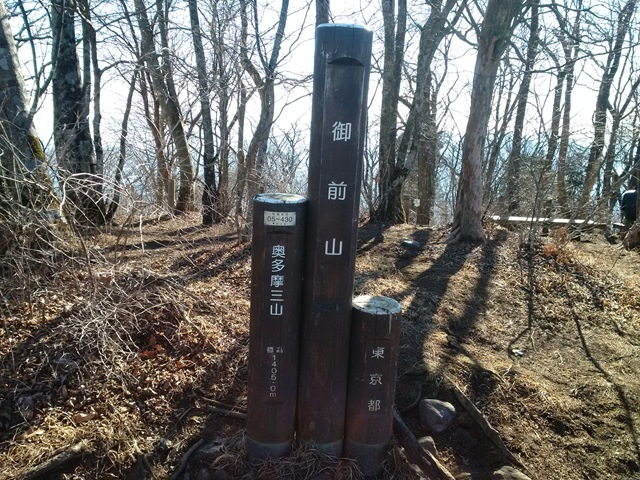 Most people hiking Gozenyama seem to approach it from the south east, finishing their hike at the Okutama lake (奥多摩湖) bus stop. However, after my experiences on Mitoh san, I was keen to tackle the big elevation change fresh, and as an ascent rather than a descent. So I decided to tackle the last of the three peaks from the Okutama end, finishing at the bus stop at Sakaibashi (境橋バス停) a little over 10km away. Access to the trail head is pretty simple. Catch the Ome Line Holiday Special train from Shinjuku and ride it all the way to the terminus at Okutama. Catch the bus to 奥多摩湖 from directly opposite the station entrance, and just 15 minutes or so later you’ll find yourself on the northern shore of Lake Okutama. Head across the dam, and the trailhead can be found on your left by following the little avenue of wisteria plants. I arrived at around 9.40am on a Sunday morning, but surprisingly the place was pretty much deserted apart from one fellow hiker heading in the same direction as me. The sun was just peeking over the first ridge as I set off on the first leg and the weather, while decidedly fresh, looked set fair for the day. The first job was to divest myself of unnecessary clothing layers as I knew that the tough climb at the start of trail would get me plenty warm enough in no time. When walking in winter, you obviously need to make sure you have sufficiently warm clothing to combat the chill mountain air once you stop moving. But it’s equally important to make sure you don’t overheat once you start tackling the steep trails. It’s very easy to become lazy and just put up with the perspiration and plod on. But once your clothing becomes wet, you will lose warmth very much faster (about 25 times in fact!) making for an uncomfortable experience at best and increasing your risk of hypothermia at worst. From reading the trail report on David Lowe’s excellent blog Ridgeway Images (see below) I knew that the first section of trail as it climbs away from the lake is pretty brutal, gaining around 200m in elevation in about 430m. And so it proved to be, climbing up the spine of a narrow ridge between the bare beech trees. But being fresh and ascending rather than descending, it didn’t present any particular difficulties. In several places, ropes have been strung between the trees to help you steady your footing on the steep climb. The trail continues steeply upwards. As you break past the 700m contour, you are rewarded with a great view of Lake Okutama now hundreds of meters below to your right. The drop-off down to the lake is pretty much vertical here and a slip on fallen leaves could definitely spoil your morning, so be careful when descending. The trail threads its way up the ridge, becoming narrow in places but relatively straightforward. At various points along the way, Lake Okutama comes into view – it’s changing perspective testament to the rapid elevation gain as you climb towards Sasusawayama サス沢山 By the time you arrive at the 941m summit, you will have gained around 450m in just over 1km. From here the trail levels out for a while as it turns south east towards the next peak, Soudakesan 惣岳山. 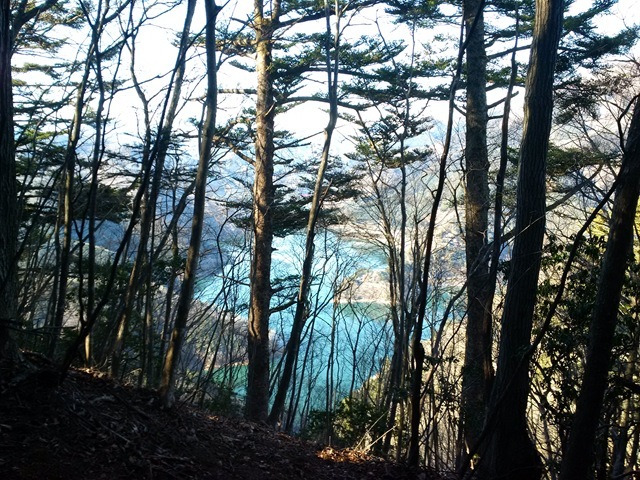 But the relief is short lived as the incline again begins to bite as you head towards Soudakesan’s 1341m summit. This section of trail has a couple of rocky outcrops with precipitous drops to the left side, so again you need to be careful here if descending this route. 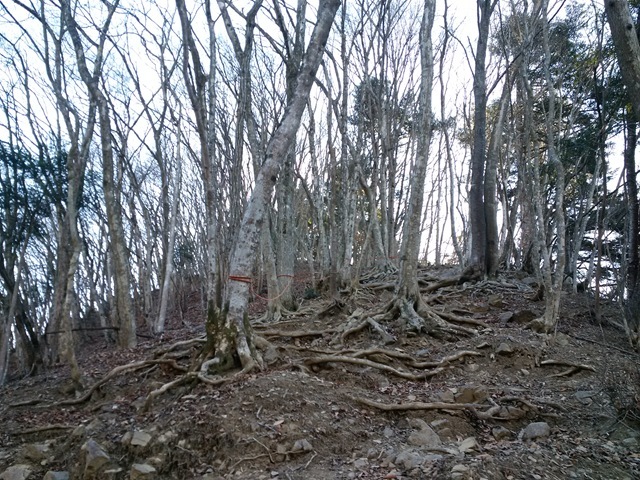 After about another 1.2km, the summit of Soudakesan is attained. 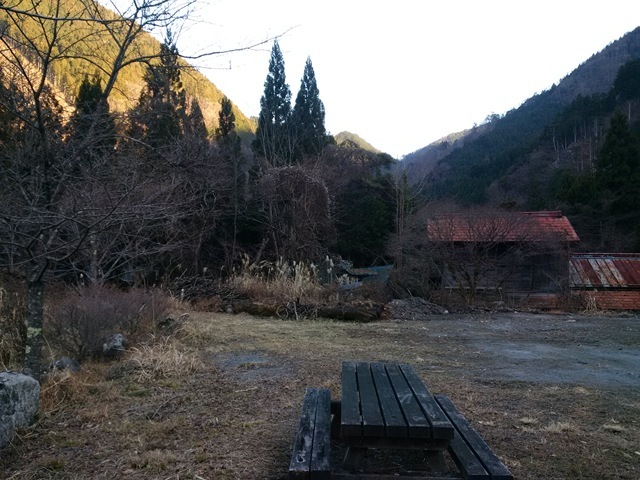 A small clearing and some seats provides the chance to rest weary legs before continuing on towards your goal, Gozenyama. The elevation gain on this next section is a little bit more forgiving but there is still plenty of effort required before you finally gain the summit of Gozenyama at 1405m. The large clearing at the summit provided my lunch spot and I wasted no time in setting up the gas cooker and whipping up a quick rice dish. Alas, I discovered, at the cost of my cup of chicken soup, that the sturdy looking benches around the clearing are actually not very sturdy at all. But luckily I managed to grab my rice pot before it joined the soup, now soaking into the earth under the bench, its sweetcorn kernels no doubt providing an unexpected windfall for the forest’s residents later that evening. All that morning, my progress had been diligently logged by my new Garmin e-Trek 20, on its first proper outing. Having meticulously plotted and planned my course using the excellent Garmin Basecamp desktop app, the little sat nav had been happily chirping all morning to alert me to a course change or waypoint reached. Not strictly necessary, as the path over this section is pretty well marked. But very useful none the less. The Garmin is a great little box, and it was to prove a lot more useful during the afternoon’s hike to alert me to various trail closures and diversions that I’d previously mapped out. In my view, a GPS device such as the Garmin should never take the place of a map and compass. Although pretty accurate, the GPS signals can be scattered and reflected in mountain valleys, resulting in positional errors of a few meters to many tens of meters. Nevertheless, it does provide you with a very good “reality check” that you are indeed where you think you are on the map, so in that regard it’s pretty invaluable. And the free Basecamp desktop app is really great. For this trip, I had plotted loads of information on the route in a Basecamp map, before printing it out. On the paper copy, I made lots of additional notes such as trail closures, bus and train times etc. and then laminated the whole thing to create a single A4 waterproof map that can be easily stuffed into a trouser pocket as a quick running reference that you can take manual compass bearings off if required. It’s also a convenient place to make trail notes or mark off any places of interest for future reference using a chinographic pencil. Suitably refreshed, I packed up and headed off for the descent. 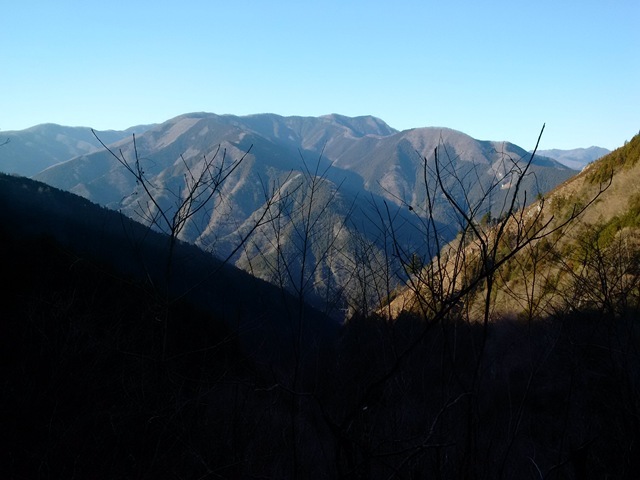 After tackling a steep flight of wooden steps, my trail turned north east towards the Gozenyama refuge hut (御前山避難小屋) and the Okutama tomin no mori (奥多摩都民の森), a recreational forest park – a bit like a scaled-down version of the Tokyo tomin no mori park I started my Mitoh san trek from. The hut is reached in just a few minutes from the summit. It looks well maintained and there’s water here. But perhaps not a good place to pitch a tent as there isn’t much flat ground to be had. The trail from here heads steadily downhill at a gentle gradient, through deciduous woodland that would no doubt look absolutely spectacular in autumn. But for now, the trees are slumbering and all is quiet. The park has numerous trails that criss-cross each other, sometimes making navigation a little confusing. The Garmin really came into its own here, acting as reference point. The park’s website had noted some trail closures and other hazards but these were easily avoided thanks to timely alerts from my new little friend, and eventually I arrived at the forest road. There’s a small rest area with toilet here, and a view over the head of what becomes a river valley further down the trail. Regretfully, the trail that follows the river down into its rocky gorge was closed, so I had no alternative but to follow the road as it meandered downhill. By now the sun was beginning its journey to bed, creating rich golds and deep luscious shadows across the hills and valleys. On the way down, I passed several small little hamlets and forest workers using their special crampons to climb high on the cedar trees lining the road. Apart from that, I wandered alone and unnoticed just taking in the sights, and after about an hour or so, I popped back out onto the main road and the bus stop to carry me back to Okutama. All in all, a very agreeable hike- made so much better by planning the route to front-load the hard hiking so that I arrived at my destination relaxed and pleasantly sated rather than totally shagged-out. Hiking, after all, should be fun. So with the Three Famous Peaks of Okutama checked off the list…where to next, I hear you ask. Well, for my next aventure I will be heading a bit further afield; much further in fact – to the mountains of Yamagata for a rendezvous with the Snow Monsters of Zao. Next Post What can we learn from a grain of sand?